Players trying to improve clubhead speed, ability to flatten the shaft in the downswing, and face control, will benefit from a deeper understanding of how to use the ground and their lower body. Your lower body creates a large proportion of your clubhead speed, so learning to use the lower body correctly will certainly help you pick up distance. Some amateurs have read or heard about shifting their weight and this can complicate the matter for them and cause some undesired effects to their ball striking. Over shifting laterally towards the target and lack of proper lower body rotation can force your hips to thrust towards the ball and target during the hitting zone. The issue with this is the body stops rotating and the handle of the club rises and becomes less stable through impact. When the lower body is turning and your spine stays in posture, the handle can stay lower through impact, and due to the rotation, the face will stabilize. When a player initiates their downswing there is a specific way most great ball strikers will do this. Boditrak is a pressure mapping system that has helped us understand the way players use their lower body, specifically their feet, to create speed and initiate the downswing. When players load their weight in their early downswing there is a squatting motion where the players target side knee starts to bend and rotate towards the target, which starts to rotate the players’ hips towards the target. This is also aiding in the shifting of the weight forward toward the target by pulling the weight towards the lead foot, more specifically the lead heel. By the time the club gets waist high there is finally a lifting or jumping motion to help maintain the speed at the bottom of the swing. Watch the following video to get a better understanding the lower body motion and sequence we are discussing. Also, how the BodiTrak system monitors the pressure through impact. In the next two videos there are also two drills that will help you obtain some of this lower body rotation that is needs to create more speed and stay in posture through impact. Now that you have seen how the lower body initiates the swing, there is also one additional benefit that lower body rotation is assisting player accomplish in their down swings. Flattening the shaft in the mid downswing is certainly a dynamic motion and not something you can create solely with your hands, forearms, wrists, or lower body rotation. However, the phenomenon of flattening the shaft is aided, not solely created, by the dynamic rotation of the lead knee and squatting motion. The lower body motion help the pulling of the hands to create an effective hand path, that will help the club to flatten in the downswing. See the following images for a better description on flattening the shaft. Flattening the shaft is what allow players to maintain tension on the shaft, what some players feel as maintaining lag with the wrist, which is not really happening. 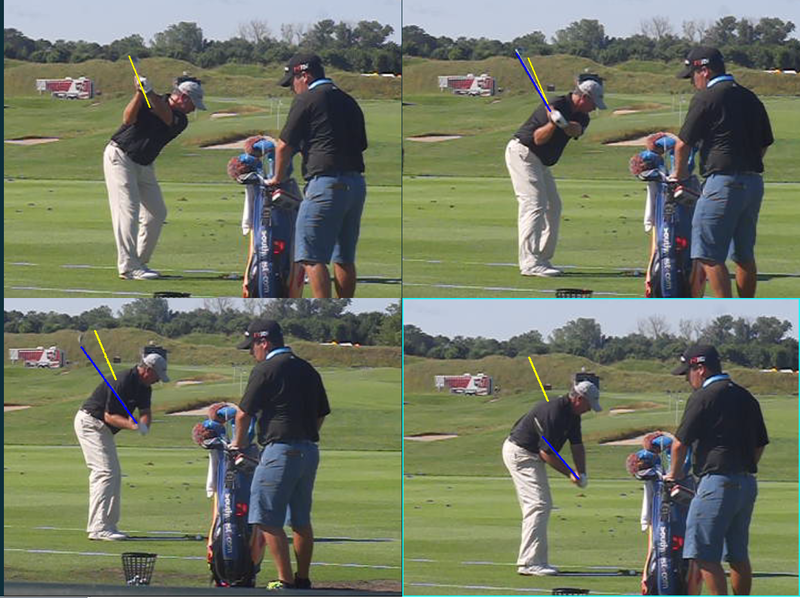 Maintaining tension on the shaft in the early downswing is what allows the player to continue rotating through impact. 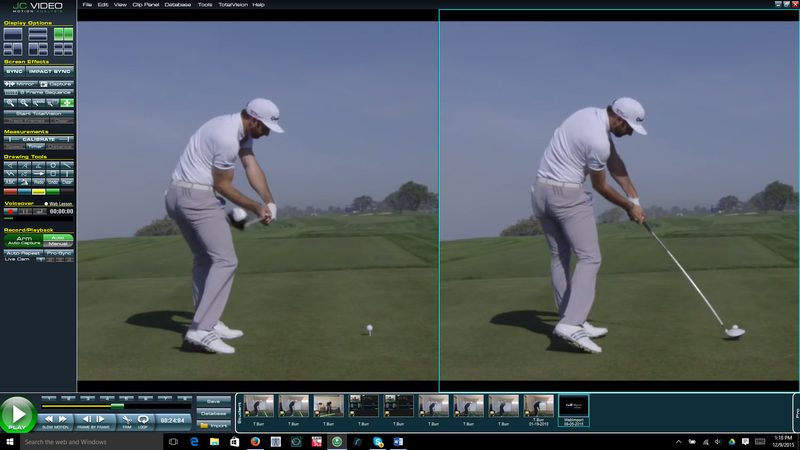 I will leave you with two images of Dustin Johnson, this is the effect due to the left knee starting the squat and rotation as we discussed and also what happens when you maintain tension on the shaft by flattening the shaft of the club in the downswing. The answer to the initial question is when we rotate we are starting the shifting our weight to the lead foot and as long as we cover with the trail hip and shoulder through impact we will have much better ball striking.